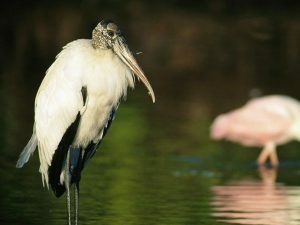 The Wood Stork is a large wading bird belonging to the “Ciconiidae” family. The bird was formerly known as Wood Ibis, although it is not a true ibis. They commonly inhabit the swamps and ponds of North and South America. Height: The height of these birds range between 33 and 45 inches. Wingspan: Their wingspan stretches to almost 70 inches. Weight: The males weigh around 2.5 to 3.3 kilograms and the females weigh around 2.0 to 2.8 kilograms. Some large birds can weigh up to 4.5 kilograms. Color: These birds appear milky white when they are on the ground. The legs are blackish-gray in color with pinkish feet. The wings appear black when these birds are on flight. The head is brown in color and the face has a black coloration. Bill: The bill is long and curved. It is yellowish black in color. Tail: They have a short tail which is black in color. Juveniles: The juveniles have a browner neck and a pale colored bill. Here are some common behavioral patterns of these birds. Wood stocks live in colonies. They build their nests on the top of high trees. They are frequently seen flying with flocks of ibises and egrets. 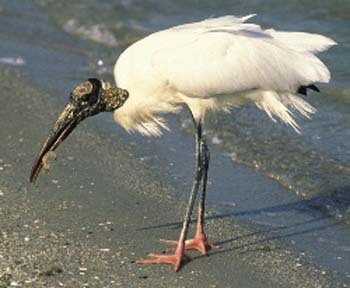 Wood storks are waders, i.e. they slowly walk on the surface of shallow waters while looking for food. They prefer to forage on open wetlands where there is a large concentration of fishes due to lowering water levels. These birds cool themselves by peeing on their legs. The sun rays evaporate the urine and leave them refreshed, much like sweat. 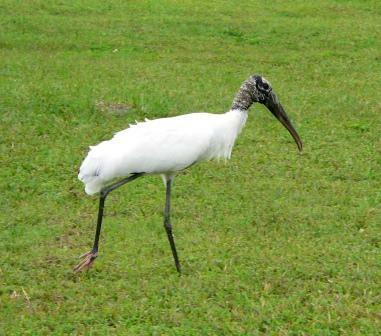 Wood storks normally feed on small fishes, frogs, tadpoles, crayfishes and large insects. These birds are found in many areas of North America, Central America, South America and the Caribbean Islands. Wood storks like to inhabit open wetlands and paddy fields. 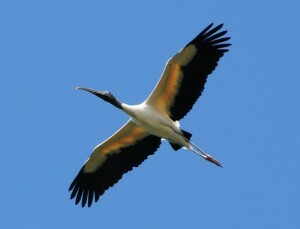 They love to make their nests above cypress trees in swamps and marshes as well as on mangrove trees. These birds are not true migratory birds. They move from one place to another in search of food. When the food supplies become scarce, they will eventually move on to an area with greater availability for food. These birds glide across the soaring sky with outstretched necks and legs. While in flight, they make sudden diving motions when they spot their prey from a distance. These birds are normally very quiet as they have got no muscles connected to their larynx. Occasionally they make a croaking or hissing sound. 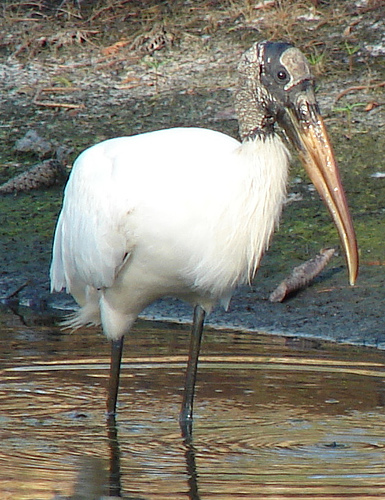 The eggs of wood stork birds are attacked by striped skunks, vultures, corvids and grackles. The nests are mostly attacked by raccoons. The adult birds are very rarely preyed on by American alligators. Wood storks have developed some potentially strong adaptations to catch their prey and survive from the grasp of their predators. Some of these adaptive techniques have been described below. These birds have developed an effective technique to catch their prey. They dip their opened bills underwater and wait for a fish to pass by. As soon as they feel a fish nearby, they close their bills in less than 25 milliseconds. This extremely quick reaction time is practically unmatched by any other vertebrates. They are also quick to move and fly away as soon as they spot predators like raccoons and alligators. They stand on their long legs and can spot a predator from a far off distance. Wood storks breed during the hot months when the water of the ponds and lakes dry up. Wood storks breed at a time when there is an ample availability of food. These birds require more than four hundred pounds of fishes during a breeding season to provide for themselves and their chicks. Hence they wait for the hot months when the lakes dry up and all the fishes have to move to smaller water bodies. This makes fishing a lot easier for these birds. These birds make their nests out of twigs, vines and moss on top of tall trees. The females lay one clutch in a year consisting of 4 to 5 eggs. Both the parents incubate the eggs for a month. The chicks are born helpless and unable to fly. They weigh around 2 ounces. The survival of the young birds depends on availability of food and protection from predators. A single breeding season is considered to be successful when at least 2 chicks survive. The chicks are fed almost 15 times daily for the first two months. After that they become capable to survive on their own. During these first months, the parents will keep close watch over the nest and take turns to hunt for food. The young chicks weigh almost 10 times their birth weight after 2 weeks and 25 times after 4 weeks. When the chicks are about 4 weeks, both parents regularly leave the chicks to hunt for food and this trend continues until the young birds leave the nests. The chicks may return periodically to obtain food from parents. The average life span for these birds in the wild is almost 11 to 12 years. However, they can live up to 30 years in captivity. 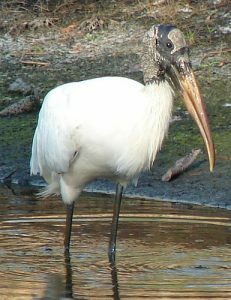 Wood Storks are somewhat endangered in some places of United States like South Carolina, Florida and Georgia. However, this species is listed in the category of “Least Concern” by the IUCN. Here are some interesting facts about these birds. Wood Storks use their own pee to cool themselves. These birds have got very quick reflexive actions. They were once known as Wood Ibis, even though they are not a true ibis species. 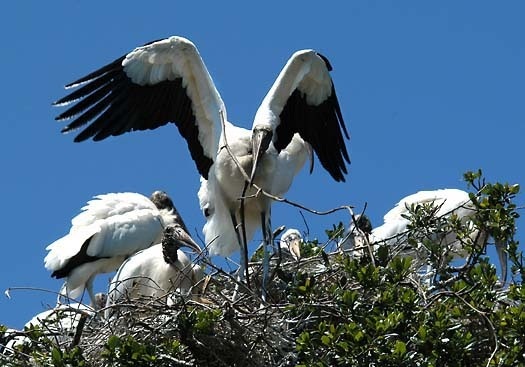 A wood stork colony is known as a rookery. Once they are frightened, these storks will permanently leave their nests and never come back again. Here are some images of these beautiful storks.